In today’s Masonic world, I find that most lodges treat new candidate recruitment and admission in one of two ways: as a shotgun, or as a sniper rifle. I admit, it’s a dangerous analogy to make, given that gun ownership is currently such a hot button issue, however a careful examination will prove that it is both prudent and fitting. On one side, you have lodges who view recruitment as a shotgun blast; let’s bring in as many candidates as possible, in the hopes that one or two of them will stick. This type of lodge generally performs their degrees in one day (the so-called “Blue Lightning” classes), bringing in many men at once, and turning them loose at the end of the day as Freemasons. In the best of these lodges, there are mentors assigned to each man, so that they can continue to learn from the experience, and in the end still will make good Masons. On the other side, you have lodges who view recruitment as a sniper rifle; they very carefully choose who they will admit, spending time selecting only those they deem worthy based on a set of ever-changing standards. Often, you will find that they only bring in one or two new members a year, and although those new members will stick around, their growth is not high enough to offset the attrition they are experiencing due to their aging membership. I belong to two lodges in my home state; one of each type. In the larger lodge, the attitude is to bring in as many new men per year as possible, without resorting to one-days, accepting the loss of many of those men as inevitable, and hoping to retain a few good ones. While we do assign mentors to these men, the main purpose is to teach them the catechism, as our lodge requires the traditional “long form” prove-up between degrees. When we retain a man, he generally turns into an amazing brother, who will climb through the advancing line of leadership, and the lodge becomes better for it. It also provides us plenty of practice for degrees, and as a result we consistently have one of the better degree teams in the state. Having said that, there are issues to this approach. Officer burn-out is common. Many men who would have been great brothers are lost due to (what they perceive as) our lack of interest in them as individuals. For those lodges that do participate in the one-day degrees, we find that the percentage of those who are retained is even lower; many find themselves disappointed that there was not more to the experience, and simply never come back. In the smaller of my two lodges, the attitude is very different; we’re a close-knit community of friends, and are reluctant to let new men join until we’ve met with them multiple times, done a thorough vetting process, and verified that they’re a “good fit” for our lodge. The men we bring in almost invariably stay for life, and even if they’ve moved away they maintain a dual membership with our lodge, and we generally are all close friends. While this sounds perfect, please note there are issues here as well. Our lodge is fighting to maintain our current membership levels. Our rate of attrition is growing annually, and while the replacement members are generally younger, a time will come when we don’t have enough members left to maintain the lodge. Due to our low membership numbers, our funding is significantly more limited, and the much needed repairs that our building faces have to be much more carefully planned and executed. Both styles have some great advantages, and both come with unique issues. I’ve heard from many brothers that after ten years in the Craft, how you came in makes no difference in the level of education and involvement you find from these brothers, and I believe this to be true. One of my dearest brothers was the “victim” of a Blue Lightning class, and continues to be active in Masonry many, many years later. There must be a happy middle ground somewhere; where we bring in a reasonable number of new members, enough to show positive growth across the fraternity, but bring in only those who will be active and involved, and who will give back for all that we have given them. This is the point where a very smart, traditional author will offer the solution he has been carefully leading you to. Unfortunately, I don’t have the answer. Believe me, if I did, I would sell the secret to every lodge in the world, and retire early, knowing I had done something great for the craft. If there is an answer, I think it must come from blending the best of both methodologies, while removing those parts that detract from the overall goal. For lodges that take a shotgun approach, consider slowing down a bit, being more selective in who you choose, and forcing your candidates to receive their degrees the “hard” way. For those lodges who are taking more of a sniper rifle approach, consider opening up to more new members, take a few more risks with your candidates, and you may be happily surprised by both the quality and quantity of new men you receive. Sometimes, simple awareness of a problem is enough to help you on the path to fix it, and in that I am in hopes that this short article will help your lodge to identify how they view candidates, and more importantly, what steps they can take to improve the functioning of your lodge. Whence came your Grand Lodge? The first time I saw it hanging in the Grand Lodge building in Columbia, Missouri, I thought, "That is the most complex, convoluted, confusing thing I have ever seen." It was also captivating. That "thing" is a large map of the United States as it existed in 1939. In other words, there is no Alaska or Hawaii and, for some reason, it also lops off the bottom part of Texas (given the traffic I've encountered in Houston, I've often thought that might be a good idea). The map's title reveals it to be the "Genealogy of Masonic Grand Lodges of the U.S., prepared by George B. Clark, Denver, Colorado, September, 1926, revised September 1939." The Masonic Service Association published it the same year. The individual states are colored either blue or gray, with concentrations of the blue states mostly in the midwest and west coast. The Great Lakes are an appropriate aqua color. Michigan's Upper Peninsula is also aqua, giving one the impression it may have been submerged at the time. There is a large circle inside or (in the case of the smaller New England states) near each state. In the blue states, the circle is filled with white. In the gray states, the circle is gray with a red border. Also inside most states is a series of smaller circles with the same color scheme. Finally, in a master stroke of chaotic genius, a network of red lines connects the large and small circles. The large circle inside Missouri is inscribed "April 24, 1841," indicating the Grand Lodge's date of origin. * That circle connects to smaller circles labeled "140," "150" and "153." Those circles connect to ones in Kansas containing, respectively, "1," "2" and "3." 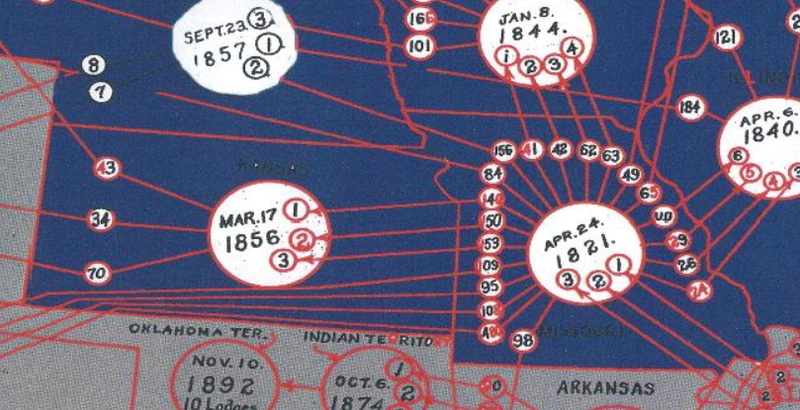 In turn, those three Kansas circles connect to to the large one in that state, which says, "March 17, 1856." In other words, the Grand Lodge of Missouri chartered Missouri Lodges 140, 150 and 153, all located in Kansas. Then, when Kansas became a Grand Lodge on March 17, 1856, those Lodges became, respectively, Kansas Lodges 1, 2 and 3. For the record, those were Kansas Lodges Smithton 1, Leavenworth 2 and Kansas 3. 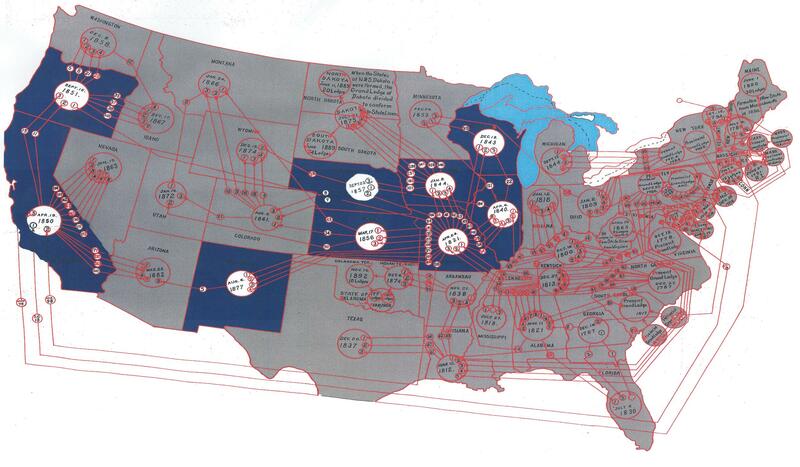 This intricate map shows the same information for each Grand Lodge in the continental United States. You can follow the history of your own Grand Lodge by clicking on the accompanying link. The map is a patchwork of color: blue states, gray states, red lines and so on. Some of the smaller circles connect to other circles with black numbers or red numbers or, in some cases, both black and red. There is no accompanying key to explain the meaning of those and other color variations. Without such indications I was quite curious to find out what all of the complex coloring meant. I called MWB Richard Fletcher who, at the time, was Executive Secretary of the Masonic Service Association. "I have the original map here," he told me, "and there are no colors on it." Hitting that dead end, I called RWB Ronald Miller, who was the Grand Secretary of the Grand Lodge of Missouri. "We created that map," he said, "for our Masonic Museum. The consultant we hired for the project told us colors have more impact, so they were added for that reason. The colors are random... they have no meaning." Disappointing, but it just goes to show the old adage is true: "A camel is a horse designed by a committee..." or a consultant trying to justify an outrageous fee. *The Grand Lodge of Missouri recognizes April 21, 1821 as its official organization date. Historical documentation indicates the brothers did not assemble until Monday, April 23, 1821, and did not have a quorum until April 24, when the actual business of the meeting and election of Grand Officers took place. On the cusp of yet another "journey" I am in deep contemplation. In a few days time, I will be flying from L.A. back to Chicago to pack a few items and drive the 2,000 miles back to L.A. Fly out Monday night, do what needs to be done Tuesday, meet some Brothers for lunch and start the trek back that night so that I make sure I am back for a volunteer engagement I have committed to that weekend. After my divorce and moving back to IL from WI, I have already thinned my possessions greatly. Here is the tricky part, U-Haul has made the renting of a trailer financially impossible. I have a full size quad cab pick up truck with a hard bed cover and a Harley to get moved to Cali. I will have to take the hard cover off the truck and leave it in IL. with my H3, putting the Harley in the bed (hopefully) which greatly reduces the room for my stuff. The last time I drove this trip, it was the other direction and a different route. Now I have to prioritize my few belongings and decide what stays and what comes with me for the foreseeable future. What can not come with me are things like my grandparents dresser set or my year old queen bed. My kitchen set has to stay along with my plates and utensils and my rolling tool box. Luckily I packed heavy on the flight out and most of my clothes are already here. I have things that need to come with me like fire helmets, bins of books and family keepsakes and some tools. Tools that I just bought because I had sold all my power tools before moving less than a year ago. I don't believe that I will be able to close the tailgate of my truck, so the bicycle mount and my mountain bike will have to stay. My question to you is this... In a life that is supposed to be more esoteric and free of material wealth and when I have already removed so much from my possessions, how do you prioritize what you take with you and what you leave behind for an unknown amount of time? P.S. - The Humidor and Masonic Artifact Collection are coming with me... after loading my Harley, they will be next to secure a place in the truck. Those who know me within Masonry know that I’m a bit of a ritual nerd. I think our ceremonies are some of the most beautiful I’ve ever experienced, and each time I watch them, it feels brand new to me. One of my favorite things to do Masonically is to take a piece of ritual work apart, and examine it from different angles, to try to understand the deeper meanings hidden within. “What come you here to do?” It’s a question we are asked to consider in our Entered Apprentice degree, and while the answer is provided for us, it is up to each of us to determine what that means in our own lives. There are two nearly identical answers to the question, depending on your jurisdiction, and the only grammatical difference is the placement of a comma. The difference in your stated purpose, however, is radical. Some jurisdictions (my own included) do not have a comma in the answer, and as such it reads “To learn to subdue my passions and improve myself in Masonry.” When read this way, you are here for two purposes: to be taught how to control your passions, and to become a better Mason. It’s possible that, in those jurisdictions without the comma, Albert Pike stole the comma for use in his writings. Some other jurisdictions have the comma inserted, so that your purpose is “To learn, to subdue my passions and improve myself in Masonry.” Now your purpose is threefold: first and foremost, to learn, second to control your passions, and third to become a better Mason. It’s a subtle difference, but an important one. Under this text, you aren’t just learning how to subdue your passions, you’re learning about a myriad of subjects. In addition, the focus is much more on action; you are actively seeking to subdue your passions, not just learning how to do so. While I would never say that the ritual in my jurisdiction is incorrect, I will happily admit that I like it with the extra comma better. It puts more emphasis on working hard to be better men, and doesn’t limit the scope of your learning to a narrow field. We often say that our fraternity exists to make good men better. We don’t say to make better Masons, because Masonry is a collection of tools we should be using to turn ourselves into better men both inside and outside of the fraternity. If our goal is only to make better Masons, we should solely be focused on things such as improving ritual work, and learning to love the reading of the minutes. Masonry is a lifelong pursuit of knowledge and perfection, and in the final tally, any improvement we make is worth the effort put in. With that in mind, what come YOU here to do? There has been talk over the years about "empty seats”. What about the Brethren that may have fallen out of touch with Lodge, how do we get them to come back? The problem with this issue of "empty seats" (from the perspective of getting people to come back to Lodge) is that there are hundreds of reasons that people simply stop coming and the fault is not always to be laid at the feet of the disenchanted Brother. There are plenty of reasons and/or excuses that one could use but some/most or all of the blame should be on the Lodge itself, in my opinion. Regardless of the reasons why a Brother chooses to stop attending Lodge, I will say that at least half the blame for allowing this Brother to walk away from the Craft lays squarely on the Lodge and the members that do regularly attend. Yes, that is a blanket statement that you can write down, take to the bank or use as the basis for your hate mail. I really don't care. In my opinion, it is the truth. I will get to the specifics that prove my point in a second. If your Lodge has living Brethren that nobody has met or Brethren that have not been to a Stated Communication in 5 to 10 years or if your Lodge has Brethren that just one active member would not know if they passed them on the street, you, the Officers and every single member of your Lodge has failed the Lodge, the Brethren of the Craft and your obligations. Now, before you "Past McWorshipfuls" (Yes, I am coining a new term... Past McWorshipful, I will define this at the end of the article) jump on me and tell me all your wonderful rhetoric about how awesome you are and how many people you brought into the Craft during your year, let me stop you before you even inhale to bloviate. Just because you are the "next guy" moving up the chairs has no bearing on your actual ability to be an effective Leader. Whether your Lodge actually elects its Officers based upon their merits or just pushes the next new guy up the line of chairs, unless that person going to the South, West or East is actually "worthy" of the responsibility and has done some deeper research into the lessons of the Craft Lodge, they shouldn't get voted up. During each Raising, the Candidate is not the only person taking an obligation. The Lodge as a whole is given a Charge. When it comes to a Brother failing to return to Lodge, I think that the Leadership has failed to cultivate the tenants of the Craft. I say that we have all failed to use the Trowel to spread the cement of Brotherly Love. The Lodge has not pondered well their actions or energies. What do our grips, signs, words, tokens or even the penalties mean if there is nobody left to care? So the question isn't "why didn't they come back?” The reason isn’t "this wasn't what they were looking for.” The real question is, “what did you or your Lodge do to keep them coming back?” Where did the Lodge fail to recognize the Brother's needs or wants? Does your Lodge unlock their doors 10 minutes prior to the gavel falling and have a race to see if the door can be locked before the last light goes out? Do you only meet once a month? Why not once a week? Do you make a meal at the Lodge before meetings or meet down the block at a restaurant to promote some Brotherhood before or after Lodge? Wait, what? After Lodge? Yes! After Lodge you can actually go out and relax as a group! Get a beer, have a cigar, sit in the library of your building to expand on education or anything to build that bond that only time together builds. If your Lodge is not active in the community ask yourselves why. You can get yourself out there with a hotdog cart during the parades in town. Sponsoring something during a local event, anything. When you give out a scholarship, do you get a picture taken with the recipient and make a big deal about it in the paper and issue a press release? Sponsor other local non-profits and allow them to use your space. Maybe even offer to serve dinner at their event. Do you know where your appendant bodies are located and who the contact people are? What about the youth organizations? Can you direct a Brother to the closest Lodge of Research? How many have even heard of a Traditional Observance Lodge? What does your Lodge offer for the kids or the Ladies? There are many more ways for the Lodge to have failed the Brother, than the Brother fail the Craft. Have you reached out to your membership that is less active and asked them why they don't come around? Maybe they just can't drive anymore at night and need a ride, but didn't want to be a bother to anyone. We will never know unless we ask. We will never be able to help our disheartened Brethren find their way back to the Craft until we can, are ready to, ask the hard questions and be willing to listen and affect change on our end to entice them back. Past McWorshipful: noun; A Past McWorshipful is a Master Mason that has been Initiated, Passed & Raised then made his way to the East in under 5 years. I feel that it just isn't right to fast track your way to the leadership role until you have had sufficient time to actually "understand" the Craft and prove yourself worthy in both character and education, to be the one that is looked to for leadership. The sum of the squares of the sides of a right triangle equals the square of the hypotenuse (a² + b² = c²). Sounds simple, doesn't it? Someone just looking at a diagram of the problem can pretty much assume it's true — a "no-brainer," as they say. Oops... easier said than done, isn't it? That problem confounded scholars for ages until Pythagoras (c. 569 BC - c. 475 BC) became — allegedly — the first to prove it. Today, it still confounds high school geometry students everywhere. Let's leave the actual proof to geometricians while concentrating on another problem: he sacrificed a... what the heck is a hecatomb? Hecatomb: it's not a word you hear in everyday conversation and, in fact, I had never heard it before I witnessed a Third Degree lecture. In context, I assumed it to be some kind of animal. After all, Pythagoras sacrificed it. "Maybe," I thought, "it's a mammal... now extinct... perhaps something resembling a wild boar, only the size of a rhinoceros... yeah, that's it... a wild hecatomb." Animal sacrifice to the gods was a common practice in ancient Greece. On occasion, the ceremony took on a much more auspicious meaning to the point it required a major statement. In these cases the Greeks sacrificed as many as a hundred animals, usually cattle, and generally followed with a feast. The sacrifice and feast was a hecatomb. ...When they had done praying and sprinkling the barley-meal, they drew back the heads of the victims and killed and flayed them. The hecatomb's history is elusive. There remain only a few documented instances of such ceremonies, according to Sandrine Huber, Professor of Classical Archaeology at the University of Lorraine in France. "The landscape of the Greek Hecatombs," she says, "is a religious and civic landscape, in some cases of Panhellenic importance. [It involves] numerous and simultaneous sacrificial animals... It is... a soundscape, an olfactive landscape and finally a gustative landscape." In other words, it's noisy and smelly but can result in one heck(atomb) of a big barbeque. Proving the theorem that today bears his name was a big deal to Pythagoras; and so was his reaction to it. He sacrificed a hecatomb. Hermes believed that God (Atum) was the original source of everything; His essence filled everything; and that He controlled everything in perfection. His thought of Creation was the force that caused the Cosmic Mind (Consciousness) to exist and it was complete and perfect. The Cosmic Consciousness is the source of all knowledge and the force which makes physical Creation happen. This is done by the creation of the Cosmos. The Cosmos is the entity that is composed of the stars and planets which turn and move in their respective perfect orbits and who always return to their starting point only to begin again in endless perfect repetition. The Cosmos is the place where all matter is created into its individual forms. The Cosmos is the creator of time. Time is created by the perfect and continual revolutions of the bodies in the Cosmos. Since they all have a beginning and ending point of each revolution, the concept of before, now, and tomorrow are created. Because if their spin while in orbit we are provided with the concept of day and night. Those planets that have both a sun and moon provided their planet with the concepts of solar days and lunar days. This action also creates change. Change is created because of the ability to measure things in time. We can count our years of existence because we use the anniversary of our birth. This separation of things into past, present, and future gives us the sense of time and movement through time. This change is the parent of life as we know it. Life is made possible because the ability to change over time allows us to learn, grow, and increase. Each generation of creation is more advanced (physically, mentally, or spiritually) than the last one and more capable of knowing and understanding the principles of Nature and Creation. Hermes goes on to say that it is the job of mankind to nurture and respect the creation process and that it is also our job to nurture and preserve our planet. This process described by Hermes is very similar to the explanation of the Creation to be found in the Mystical Traditions of the Hebrew religion. It truly seems that the more different religious creation beliefs are studied, the more that they are seen as the same and tend toward the idea the religious thought and belief was once in total unity and divided into groups of individuals who thought and believed alike. These differences still divide us today but they need not. We may enhance the rejoining process of mankind into one unity by discarding our small differences and strongly emphasizing our many similarities. 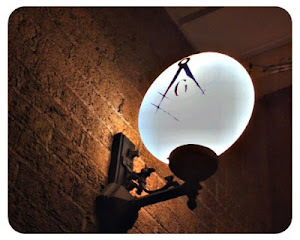 Before I delve into the main topic of this column, I’d like to express a few thoughts about “The Midnight Freemasons” blog and the brethren who write for it. I’ve been a regular reader from the very beginning and was immediately impressed by the quality of the writing. It is no secret why this blog has become so popular among Freemasons. It is an excellent mix of history, philosophy, symbolism, lodge development, editorial comment, and the personal experiences of the various writers. I am fortunate to know several of these brethren personally and I can assure you that each of these men not only talk the talk, they walk the walk of a Freemason. I am very grateful to have been afforded the opportunity to write a guest column about an event that I believe will be of value on some level to every Freemason. The Masonic Society, the Masonic Library and Museum Association, and the Masonic Information Center, a branch of the Masonic Service Association, will present The Quarry Project II on September 18-20 at the Hilton Indianapolis Hotel and Suites in downtown Indianapolis, IN. The Quarry Project is a continuing effort designed to promote Masonic research and preservation by providing instruction and guidance to both new and experienced Masonic writers, researchers, and editors, both within and without the fraternity, and to Masonic librarians and museum curators on the display, preservation, and cataloging of Masonic archives. Phase II will feature a third track on Masonic public relations sponsored by the Masonic Information Center. The public relations track will feature presentations on the use of social media and other topics designed to improve communication between Masonic organizations, their members, and the public at large. The research, writing, and editing track is sponsored by The Masonic Society. Topics to be addressed in the breakout sessions include how to obtain original source materials, how to use an academic library, communicating your research, Masonic blogging, on-demand printing, and publishing options. One session will be devoted to the recently released Quarry Project Style Guide, a project that was initiated at the first TQP in 2013. The first edition of the style guide has been released and is published on the TQP website. Several prominent Masonic publishers have already agreed to adopt the style guide. The library/museum track is sponsored by the Masonic Library and Museum Association. Breakout session presentations will include library collection development, cataloging your library collection, using your museum collection in exhibitions, photographing and numbering your collection, connecting your audience to your collection, collection policies, and a case study on building a museum from the ground up. A round table discussion regarding procurement and use of college interns will also be part of this track. The public relations track is sponsored by the Masonic Information Center. The breakout session topics include use of social media, awareness via Masonic philanthropy, public relations and marketing, advertising and media campaigns, history of the MIC, and a look at Masonic public relations from outside the fraternity. In addition to the presentations, there is ample time to network with the presenters and other attendees. The opportunity to share experiences, address specific problems, and establish connections with experts in your particular area of interest often turns out to be as valuable as the presentations themselves. You don’t have to be a published writer, author, or editor of a publication with a large circulation to benefit greatly from this conference. Neither do you have to be a grand lodge librarian or museum curator. The Quarry Project will benefit local lodges of research as well as anyone interested in conducting Masonic research. It also provides brethren who maintain the local lodge library and artifacts with information and instruction that is not readily available elsewhere. The public relations track will prove very useful not to only grand lodge officers, but to current and future officers of local lodges. Every Masonic organization has to communicate and many of the problems that plague our groups tend to be associated with poor and ineffective communication. This will be an opportunity to hear from several grand lodges, as well as those in the private sector, who have successfully managed their communication, both internal and external. You can visit The Quarry Project website at www.thequarryproject.com to view the complete list of topics and our distinguished group of presenters. You will also find all of the particulars on registration and accommodations. Questions can be e-mailed to info@thequarryproject.com . Once again, I wish to thank The Midnight Freemasons for this opportunity and I look forward to seeing many of you at The Quarry Project in Indianapolis. Bro. James R. Dillman is a native of Royal Center, IN and was raised as a Master Mason in Royal Center Lodge 575 in Royal Center, IN on March 4, 2000. After relocating to Indianapolis in 2002, he affiliated with Logan Lodge 575 in Indianapolis and served as Worshipful Master in 2005. 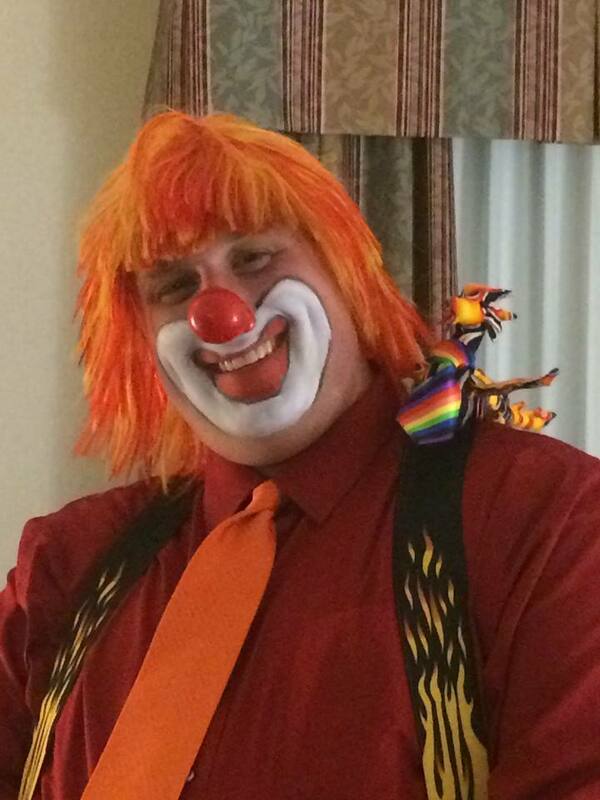 He also affiliated with Lodge Vitruvian 767 in Indianapolis and served as Worshipful Master in 2011. He is a member of the Dwight L. Smith Lodge of Research. Additionally he is a member of the Valley of Indianapolis Scottish Rite, currently serving as Thrice Potent Master of the Adoniram Lodge of Perfection. He is also a member of the York Rite, AMD and York Rite College. He currently serves as President of The Masonic Society, where he is a founding member and fellow. 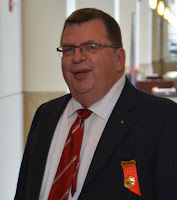 He has written for the Indiana Freemason Magazine, the Scottish Rite Valley of Indianapolis Double Eagle, The Journal of the Masonic Society, and The Art of Manliness e-magazine. He is a frequent guest speaker at Masonic lodges and related organizations. My family’s annual two-week sojourn north has come and gone, where. I usually manage to get to a stated meeting and a breakfast at my lodge there, Island City No. 330, F & A.M., but the first Wednesday of June fell on the first this year, and we arrived the Saturday after, so I was only able to go to breakfast each week. Both times it was a pleasant way to catch up with Brethren I don’t see otherwise, and whose fellowship I value. We mourn the loss of Brother Bill Hughes, who was called from labor by the Great Architect on Saturday June 27th. He now dwells in the Lodge Eternal with those who have gone before. He was Raised an Entered Apprentice on February 1st, 1970, Passed to Fellowcraft on February 21st, 1970, and raised to the Sublime Level of Master Mason on April 18th, 1970, in Valley Station, Kentucky. Bill was a Past Master and Trustee of the lodge. This year he sat in the West as Senior Warden. Brother Bill was devoted member of the lodge, and cheerfully made himself available for the numerous lodge projects that required him. 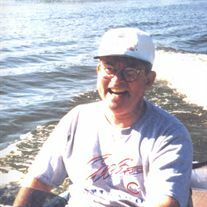 We will carry with us fond memories of his soft Kentucky accent, and cheerful sense of humor. Bill is survived by his wife Marge, two sons, Mike and Travis, daughter-in-law Jenny, and two grandchildren, Riley and Bryson. There’s not much I can add to that, save this: Brother Bill Hughes reminds me, and should remind all of us, that the messenger of death comes when least expected; that nothing we do on this earth is matters, save those things that work toward the growth and perfection of individual character, which necessarily means loving our fellow creatures and working toward their betterment. This he did. We remember Brethren like Bill with affection and admiration because those departed Brethren are exemplars of what Masonry is. As the Illinois Masonic funeral ritual reminds us, “while our eyes may be dim with tears as we think of our departed brother, we may also, in the sincerity of our hearts, accord to his memory the commendation of having lived a useful and exemplary life, and as a just and upright Mason.” So may we all be remembered. Not long ago, I published the first in a series of articles I planned on writing involving Masonic data. I asked a simple question about the Scottish Rite and you can read about it and see the crazy results of that survey here. This time around, I wanted to gauge whether or not we as a fraternity really understand what and who we are, that is--Do we know that we are a fraternity of men who are a total mix of different religions and whats more, that we are not tied to any one faith? So without bias, and for your edification, here are the results. 67.9% said there was no particular background. 13% said that Masonry is a Christian fraternity who accepts others. 19.1% said that Masonry was a Deist order who accepts others. The results are what I expected. An overwhelming number of respondents believe what I do, and that is we are indeed, "The Brotherhood of man, under the Fatherhood of God." The other results are somewhat concerning to me. nearly 33% feel that there is some kind of religious category we fit into. I'll leave you all with these results and to do with them as you will. Perhaps this is an opportunity for us to make those changes or to whisper some council in an erring brother's ear. Overwhelmingly, this boils down to a tolerance issue. And as far as tolerance is concerned, if you look it up in a dictionary, there should be a picture of the Square and Compasses. Bro. Robert Johnson, 32° is the Managing Editor of the Midnight Freemasons blog. He is a Freemason out of the First North-East District of Illinois. He is the Master of Waukegan Lodge No. 78 and Education officer for the 1st N.E. District of Illinois. He is also a member of the York Rite bodies Royal Arch, Cryptic Council, Knights Templar, AMD, The Illinois Lodge of Research and a member of the Scottish Rite Valley of Chicago as well as a charter member of the Society of King Solomon, a charity organization run by the Grand Lodge of Illinois. Brother Johnson currently produces and hosts weekly Podcasts (internet radio programs) Whence Came You? & Masonic Radio Theatre which focus on topics relating to Freemasonry. In addition, he produces video shorts focusing on driving interest in the Fraternity and writes original Masonic papers from time to time. 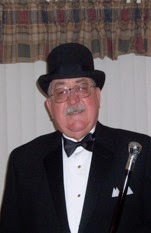 He is also a cohost of The Masonic Roundtable, a Masonic talk show. He is a husband and father of three. He works full time in the safety industry and is also a photographer on the side as well as an avid home brewer. He is currently working on a book of Masonic essays.